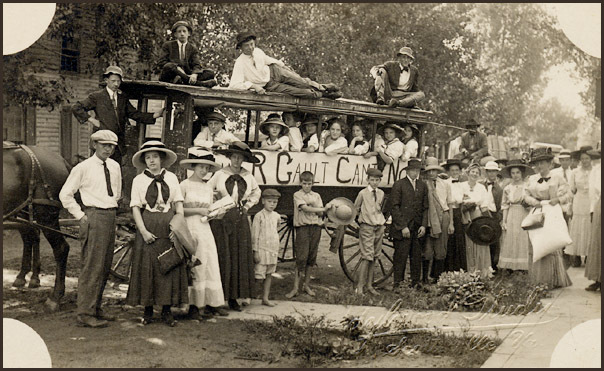 Comments: On this warm August afternoon in 1911, William Burgess photographed a large party of Scottsville-area citizens departing on a week-long camping trip. 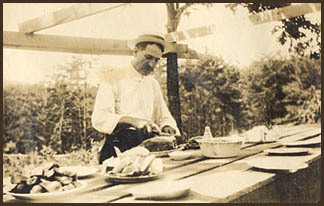 The camping outing was arranged by Samuel R. Gault, the town's postmaster and president of Gault Camp No. One. The campers traveled by the town's school wagon, autos, and train to reach their eventual campsite on Paradise Hill near Schuyler. 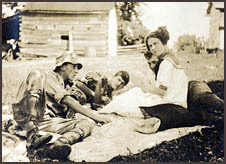 Upon arrival, they settled into canvas tents set up by an advance party and enjoyed their first meal in Ella Woody's cook tent. During the daytime, swimming, fishing, Kodak parties, hunting, target shooting, baseball, and hammocks with books and magazines kept the campers amused. At night they sang songs in the moonlight, accompanied by guitar and harps. Following is an unidentified newspaper account of the Gault Camping Party. On Paradise Hill, Schuyler, Va.
On Thursday morning, August 10, 1911, a large party left Scottsville for a week's stay at Gault Camp, "Paradise Hill," near Schuyler, Va. Mr. Samuel R. Gault, president and manager of the camping party had left Tuesday in order to make ready for the others, so when the party arrived, Thursday, they found tents already pitched, a stock of provisions, stove up, dining tables, and spring beds. Besides the canvas tents, Mr. Gault had a long sleeping tent for the girls and a dining shed. The jolly party consisted of 50 people: Mr. Sam Gault, president; Mrs. G.W. Briggs and Mrs. T.D. Williams, chaperones; Ella Woody, cook; and Misses Irene Briggs, Louise Williams, Martha Dillard, Mary Browne, Anne Browne, Rachel Beal, Emily Williams, Virginia Pitts, Kathleen Colley, and Mrs. Laura Colley of Scottsville, Va.; Misses Elizabeth Cates of Atlanta, Ga.; Julia Leonard of Lockport, N.Y.; Winnie Pitts of Arvonia, Va.; Gladys Cofer of Smithfield, Va.; Louise and Mamie Cox of Ballsville, Va.; Messrs G.W. Briggs, Chas. Dorrier, Ben Dorrier, Willie Burgess, Geo. Burgess, John Pitts, Lindsay Pitts, Geo. Briggs, John Briggs, Richard Johnson, Reeve Nicholas, Spiller Phillips, T. E. Bruce, Lee Bruce, Fred Lane, Willoughby Rhodes, Woody Rhodes, Thos. Williams, Henry Harris, Edward Browne, Wiley Beal, Magruder Dillard, and Dr. Dillard of Scottsville, Va.; Rev. Allen Christian of Norfolk, and Messrs Archer and Walter Briggs and John S. Martin of Richmond. The dining table was so long that everyone could eat at the same time. Such fun! Visitors were at the camp every day and the menu of one of our dinners will give an idea how sumptuously we fared. Sunday's dinner: ham, mutton, pickle, olives, corn on cob, sliced tomatoes, Irish potatoes, bread, butter, iced tea, grape juice, canned peaches and cakes. Gallons of grape juice-lemonade were made in the mornings to last through the day; candy by the bucket and boxfull and watermelons gave occupation to many. The site of the camp was ideal. Mountain scenery was in every way beautiful and the nights especially cool and pleasant. Mr. and Mrs. Hardwick, near neighbors, did everything they could to make the stay enjoyable in inviting the party to use their home whenever they wished. All took advantage of the opportunity to go through the large soapstone quarry and factory at Schuyler; those who wished boated and fished on the Rockfish river--just at this place the Soapstone Company has dammed the river causing it to be broad and deep--boys and girls both enjoyed bathing in the lake, and the boys hauled the seine several times catching catfish and bass; kodak parties, hunting, shooting, games, hammocks with books and magazines afforded amusement for all. In reply to a challenge, the boys of the camp played a game of baseball with the Schuyler team. The camp boys won with the score 16 to 1. In the evenings by the light of the full moon, the whole party would gather on a load of straw outside a tent and sing till nearly midnight; some also furnished music on the guitar and harps. When the moon rose too late for the concerts, the party played games and sang by gasoline lights. Although in camp the Sabbath was observed, some attended service in town in the morning and all joined in a sacred song service in the evening. Three young ladies kept the camp lively all the time and made "courting couples" and "common people," as they called all the others, live hard. A storm Sunday afternoon blew off the roof of one of the tents and dampened bedding and garments, but not the spirits of the party. Every one was happier than ever; the roof was soon on again, the girls spending the night at Mrs. Hardwick's, and the next day, Monday, clothes lines and bushes were piled with wash things hung out to dry. Thursday, August 17th, after a jolly big dinner, the party left for Scottsville, carrying with them pleasant memories of fun, frolic, and pleasure. No more congenial crowd could have been found anywhere. Three cheers for Mr. Gault! Three cheers for the chaperones and three cheers for the camp itself! The above photos are part of the Anne Shirley Bruce Dorrier collection. Mrs. Dorrier is the daughter of Thomas Ellison Bruce and Mary Browne, who both attended this camp outing in 1911. Mrs. Dorrier resides in Scottsville, Virginia.